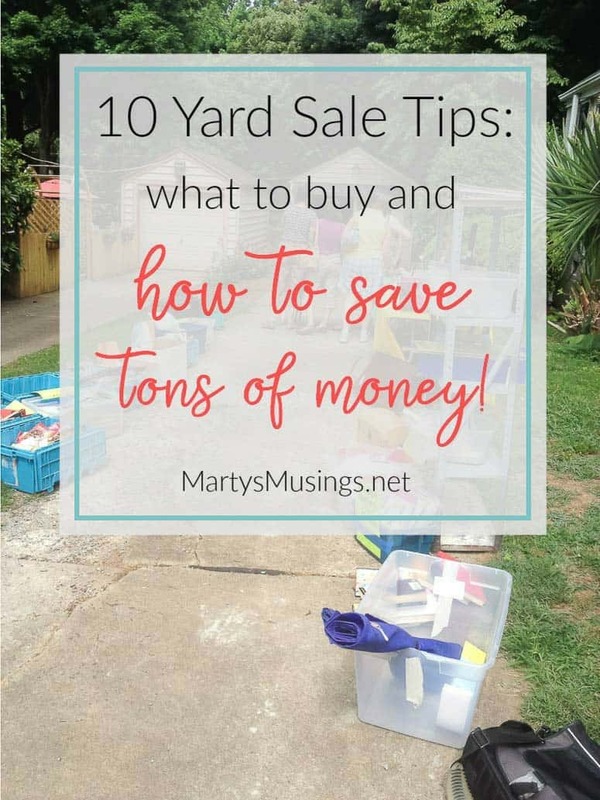 This must have list of top 10 yard sale bargains will save you thousands with all the tips you need on what to shop for at yard and garage sales, thrift stores and craigslist! 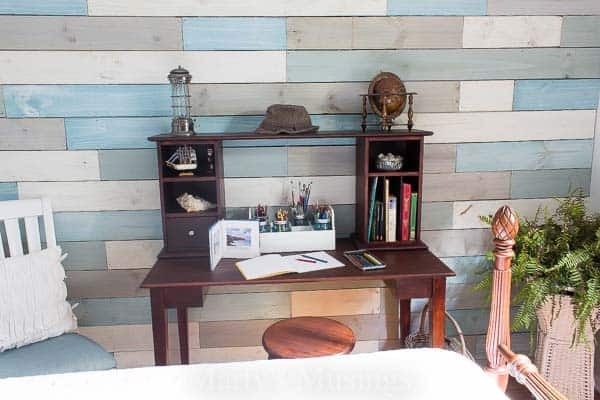 Want to create a beautiful home but you’re short on money and time? Maybe you think staying at home with the kids isn’t possible because there are too many bills and responsibilities. Probably you’re just looking to save a few bucks. Either way, I”m here to help! I was a stay-at-home, homeschooling mom for over 20 years, and although we sacrificed many things to make that happen I never felt cheated or like a second class citizen. In fact, I looked at my job of saving money as crucial to the success of our family through the years. I even used my competitive spirit and eye for bargains to have some fun along the way. Back in the old days (you know, before COMPUTERS) I read books and magazines and learned all the tricks for squeezing every penny out of the dollar. How can YOU find ways to have the home you want and still enjoy your life? Today I want to show you my top 10 yard sale bargains, what to buy and how to save tons of money! Here’s my first freebie tip for you. I try to stay within 10 miles or less of my home to save on gas and group all the sales together as I plan. I also plan out my route the night before. I use my local newspaper, Craigslist (under garage sales) and an app on my iPhone called Yard Sale Treasure Map and group according to location. I actually use a strange combination of speed shopping and rummaging. As soon as I park the car I’m out the door, scanning over the sale for large items before quickly rummaging through the boxes and tables. Here are my top 10 yard sale bargains and ways I’ve saved us thousands of dollars over the last 25 years by being a smart yard sale shopper! Make sure that your selection is well made or able to be painted, (chalk painting is the creative, inexpensive answer! ), distressed or upcycled. Think outside the box. 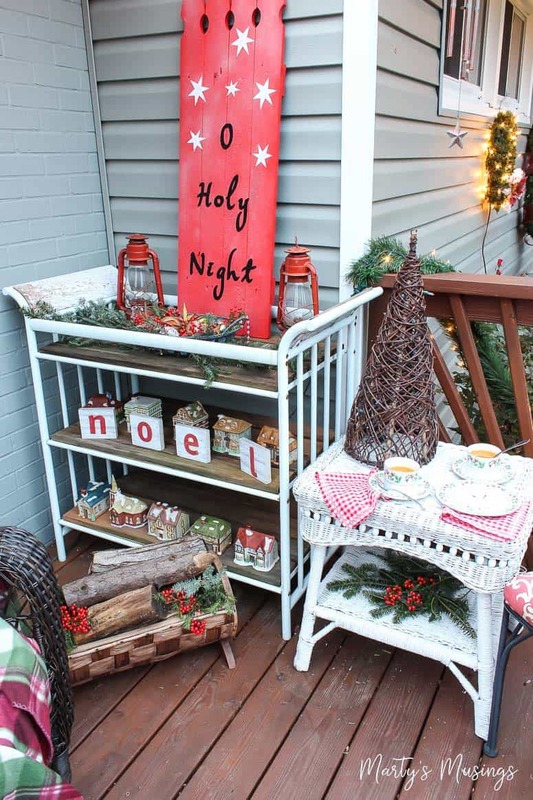 This DIY garden cart (decorated for Christmas) was a $15 changing table. Now it’s an accent piece for our front deck. Garage and yard sales contain priceless treasures. As the saying goes, one man’s trash is another man’s treasure! You can find some great deals in this area but know what you need and whether it’s compatible with newer computers and gaming systems. This includes furniture, clothes, supplies and anything else you might need. Price merchandise before you go so you will know if the item is a bargain or exactly what you’re looking for. 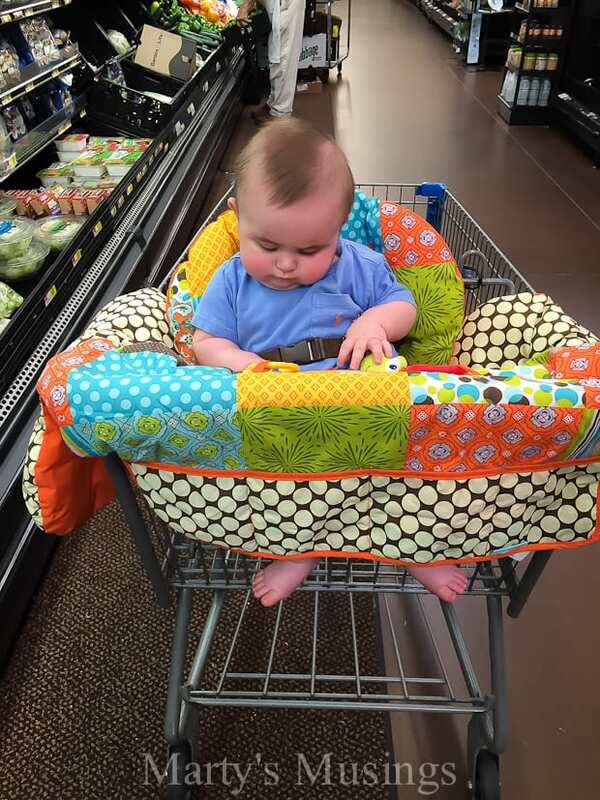 It’s also possible to get new items to save for baby gifts as well. It seems like almost every sale has a wide variety of toys. Just make sure all the parts are in working condition and age appropriate to the child you’re buying for. Since I’m a nana now I keep a stash of yard sale toys at my house for my weekly playdates with Aiden. Great deals can be found on clothing but keep a list of sizes, preferences and styles. Always check to see if buttons, zippers and elastic work and make sure the pieces are stain free. Yard sales are great places to stock up on Christmas and holiday decorations. 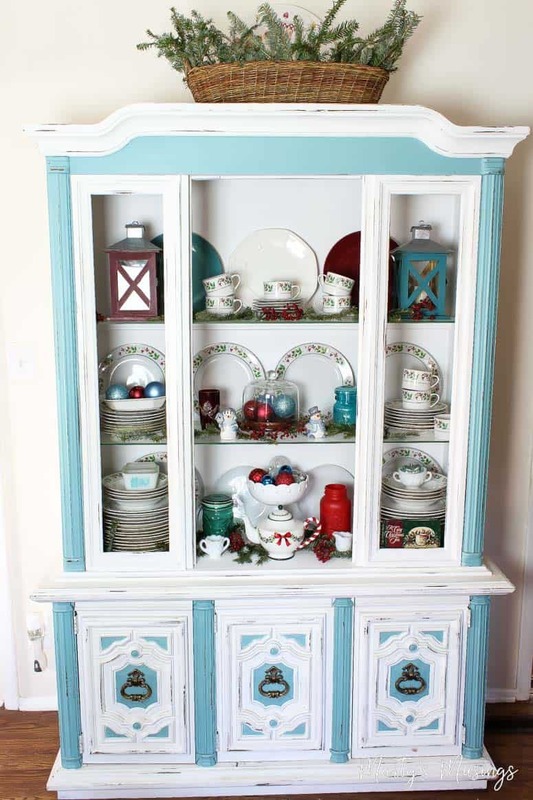 Pick up just a few ornaments or luck up on an entire set of Christmas china. You’ll be amazed at what you can find! 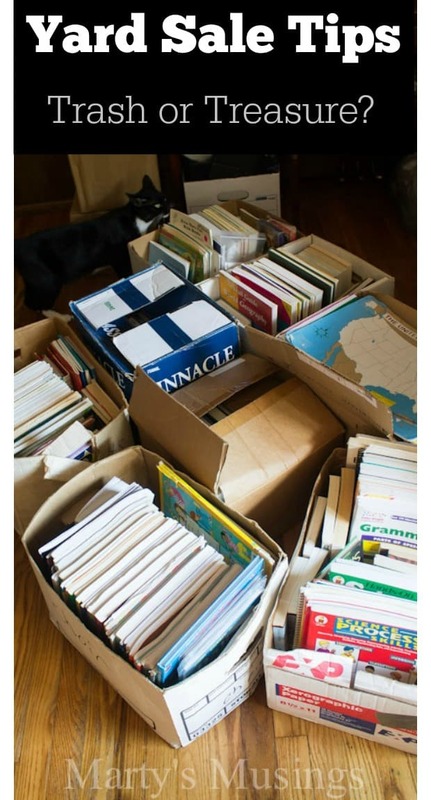 As a homeschooler I always bought a lot of used reading books, text books and games to supplement our curriculum each year. I also love using vintage or castoff books in my home decor. You’ll spend just pennies compared to new ones. 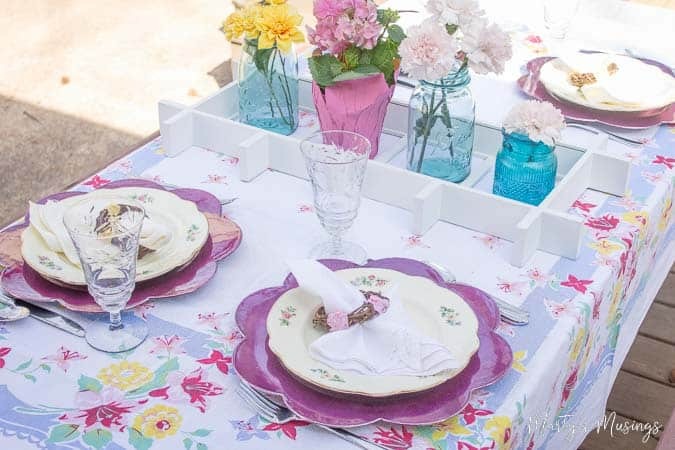 Since mix and match is in style collect dishes of all kinds and combine vintage and new without hesitation! This simple tablescape features a beautiful vintage tablecloth and china, all yard sale bargains picked up at different times. Are you in the season of life where you need lots of wedding, graduation or baby gifts? Often times you can find brand new, still in the box, presents for just pennies on the dollar. Just a few more tips: It’s helpful to have an idea of the retail prices so you can know if what you’re paying for is really a bargain. Set your price limit ahead of time so you won’t be tempted to overspend. Keep a wish list of items you’re interested in and even paint chips if you’re trying to match colors. Now go shopping and save some money! 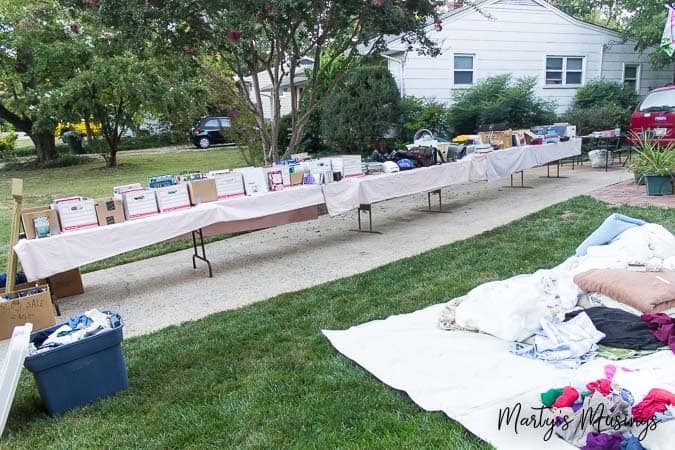 What do you think of my list of top 10 yard sale bargains? Anything you would add? Here are more tips to help you distinguish between trash and treasure! I’m an in and out gal. Scan for any furniture I maybe wanting, or can flip. Then straight to the jewellery, buy anything I think is gold or silver, or anything I can take apart and use in my jewellery making designs, mostly good beads. Vintage anything I can flip! Then I look for things for the home! This can all be done in 5 minutes or less! Wow, Patricia. You are amazing! You definitely have yardsaling down to an art form. We recently sold my minivan and now I have a small jeep. I have to stick to what I can fit in there! Let me know if you find anything great in the coming weeks! 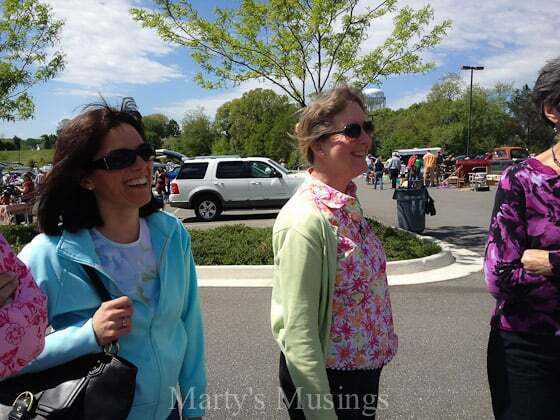 Garage sales, resale shops, and everything in between. 99.1% of my clothes are garage sale finds. My wardrobe is awesome and I have shoes galore. Most of which are brand names and I bought at next to nothing. My house decor is also GS finds and I am very proud. Hi Juana, I need to see your shoe collection! I have a harder time finding shoes for some reason even though I’m a size 8. It seems to be hit or miss for me. I love the satisfaction of dressing well without spending hardly any money. I think it’s a blessing and a gift. Great job! When I down sized and needed to get rid of about 75% of my belongings…literally, at my first big garage sale u grouped things in boxes or big shopping bags. My ultimate goal.was not to make mone, but to get rid of stuff, and get some cash too. So in each box or bag I had 1 high quality thing and a few cheaper things. Ie: a lamp, a couple of books, deck of cards $5; in another, I had a high end neck massager, 2 pricks of good silk flowers, 3 tupperware $10; my whole box of misc resisting $7.50; etc….. Only one person complained “what if I just want a deck of cards?” I said go to Walgreens! 🙂 . Bit I got rid of Everything! And made a few hundred dollars! Love your tips, and I do use many of them already, too! I enjoy finding community or city-wide sales. Most times these are advertised in the local paper before the event. Military bases have them, usually twice a year, and military folks move a lot and buy new stuff with each move so you can find incredible newer furniture and ‘stuff’ for very cheap! I take a list of my kids (i have 6!) current sizes in shoes and clothing, and while I’m shopping I think ahead to the next season and can usually guess about what size they’ll be then. This is especially important to do in the fall, when sales are declining due to the outside temperatures. Thanks for your tips, hope mine was useful too! Hi, Tonya! Love your yard sale tips! You and I think a lot alike. I have 5 kids (youngest is 17) so I understand how important it is to know sizes and be organized. You’re doing a great job! Thanks for visiting and hope you’ll stick around for more of my thrifty finds and tips. Have a blessed day! I’m having my first yard sale next weekend. I enjoyed your post. Now I’ll know how to group items in my displays. I have 3 kids (5 years, 2 years and 1 year). We are overloaded in baby clothes. I have a good amount of boutique brands, some never worn with tags. Am I thinking realistically if I want at least $5 for those? should I price them for what I want or add a few dollars for hagglers? I look forward to hearing your opinion! Thank you! I am very disappointed with your site. I can’t see hardly anything with all the ads popping up and when I try to download a picture of the recipe it doesn’t work and when I copy the recipe I get 12 pages. So please remove me from your mailing list. Hi, Judy. I totally understand about the ads, but unfortunately, that’s one way I can provide my content free to all my readers. I spend countless hours at my full-time blogging job and ads provide part of the income necessary to even begin to pay the expenses associated with owning my piece of the internet. If you right click on any picture you then have the option to save the image and print from there. You shouldn’t have to copy the recipe because each recipe has a print feature that you should be able to use which would only be one or two pages depending on the length of the recipe. If you have any other questions about a particular recipe feel free to contact me again. As far as unsubscribing, at the bottom of every email you receive from me there is the option to unsubscribe and you can click from there. Thanks.